Earlier this month we checked out the beta version of Battlefield 3 to see how it played on a range of DirectX 11 graphics cards. The results were concerning as even the latest and greatest graphics cards struggled, especially those who planned to enjoy the game in all of its visual glory. Powerful single-GPU cards like the GeForce GTX 580 and Radeon HD 6970 failed to average 60fps using the high quality settings with MSAA disabled at 1920x1200. The 'Ultra' quality settings reduced frame rates to around 40fps. Even more troubling, the final and complete 'Ultra' graphics settings were not fully enabled on the beta, with many DX11 features still to come. On the upside, however, even on 'high' Battlefield 3 looked spectacular, with loads of jaw dropping visuals to keep you enthralled. But as enjoyable as the beta experience turned out to be, there were quite a number of bugs that still needed to be sorted out. The good news is that only one month later reviewers in general are finding the final game to be quite enjoyable and considerably more polished than the beta. Our Product Finder has listed 11 reviews of the game so far, with a wide majority giving positive impressions and a very optimistic 92/100 metascore. 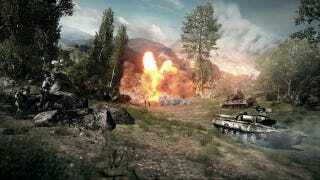 Battlefield 3 is the latest in a long line of Battlefield titles and one of the most anticipated games of 2011. EA disclosed this week that the shooter represented the company's largest day-one ship with 12 million copies distributed worldwide. As before, BF3's developer DICE recommends a quad-core CPU be used along with 4GB of system memory. Suggested graphics cards start with the GeForce GTX 560 or Radeon HD 6950, meaning that gamers will want to spend $200+ on a modern GPU to appreciate Battlefield 3. Today we'll take a peak at what's required to play Battlefield 3 as we test a number of GPU and CPU configurations. At 1680x1050 the GeForce GTX 580 was the fastest single-GPU graphics card tested with an average frame rate of 64fps and a minimum of 51fps. In comparison the Radeon HD 6970 was nowhere to be seen, as it was much slower than even the old GTX 480. Surprisingly the Radeon HD 6970 averaged 50fps with a minimum of 35fps, which is extremely disappointing 1680x1050 performance for AMD users. The Radeon HD 6990 and Radeon HD 6970 Crossfire configurations were substantially faster, but not on par of the GeForce GTX 590 and GTX 580 SLI setups that cracked the 100fps barrier. At 1920x1200 the Radeon HD 6970 was only able to average 41fps, which is much slower than the 53fps managed by the GeForce GTX 580. The minimum frame rate on the Radeon dropped to 31fps which was still playable but far from ideal. This leaves AMD users in an awkward position. They either need the Radeon HD 6990 or a Crossfire configuration that delivers comparable horsepower. The killer setting for AMD is not the Ultra settings in general but rather 4xMSAA. Typically at 2560x1600 we find that AMD graphics cards have an advantage, but this is not the case when testing Battlefield 3 with 4xMSAA enabled. The Radeon HD 6970 averaged just 26fps opposed to the 34fps of the GeForce GTX 580. Even with 34fps the GeForce GTX 580 was unable to deliver consistently smooth frame rates. At 2560x1600 with the ultra-settings enabled you'll to take advantage of multi-GPU setups that are at least equal to the Radeon HD 6990 in terms of performance. The same will be true for those running multiple monitor setups for extreme resolutions. Things to take into account here is that 46% of the AMD FX-8150 was utilized in our test, while the Core i7-2600K only reached 34%. Even the old and much lower clocked Core i7-920 only reached 40%. Meanwhile the AMD FX-6120 and Phenom II X6 1100T featured virtually the same CPU utilization result. Another interesting stat is that the Phenom II X4 980, Athlon II X2 645 and FX-4100 also had roughly the same utilization of ~70%. Finally the dual-core processors were maxed out, as the Phenom II X2 560 and Athlon II X2 265 both reached over 90% utilization and constantly hit 100% when testing. Before we discuss the individual CPU performance tests, let's just take a quick look at how the AMD FX-4100 processor scales when testing between 2GHz and 4GHz. When paired with the single-GPU GeForce GTX 580 the average frame rate goes almost untouched. This suggests to us that Battlefield 3 is not very CPU demanding, at least not enough to max out a quad-core processor, which is precisely what the CPU utilization data above suggested. The minimum frame rate does improve as clock speeds are steadily ramped up. At 2GHz we saw 63fps which was eventually increased to 68fps at 4GHz, a relatively small 8% increase for a 100% increase in operating frequency. First we tested at 1680x1050 using the high quality setting, which means MSAA was disabled to avoid a GPU bottleneck. Almost all CPUs allowed the GeForce GTX 580 to spit out an average of 81fps, with the AMD A6-3650 and Athlon II X2 265 being the only exceptions along with our hypothetical dual-core Bulldozer processor. At the top of our chart was the Core i7-2600K with 83fps, followed by the Core i5-2500K with 82fps. The minimum frame rates were also consistent with most CPUs averaging ~64 – 65fps. Now at 1920x1200 all CPUs average between 66 – 68fps, while the minimum frame rate for the most part varies between 51 – 54fps. The only processor tested that dropped behind was the Athlon II X2 265, which dipped to 43fps when measuring the minimum frame rate.